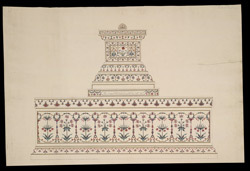 Watercolour of the side elevation of the Empress Arjumand Banu Begam's cenotaph in Taj Mahal, Agra, by an anonymous artist working in the Agra style, part of the East Collection, c. 1808-1820. Inscribed on the front in English: 'Begum's Tomb'. 'No.12'; incorrectly inscribed in Persian characters: 'Marqad i mutahhar i hadrat Shahjahan badshah i ghazi az janib i taul nawishtah shud' (The pure cenotaph of Shah Jahan has been drawn lengthways); on the back in English: 'The Begam's tomb at length. No.12'; in Persian characters: 'Qabr i Begam-Sahib bala az taul' (The Begam Sahib's grave above lengthways). The Taj Mahal was built by the Emperor Shah Jahan (r.1628-58) for his favourite wife Arjumand Banu Begum upon her death in 1631. Constructed of India’s finest marble, quarried at Makrana near Jodhpur, it took 12 years to build involving 20,000 craftsmen from all over Asia. The tomb and accompanying buildings are organised around a garden divided into four parts by raised walkways with water channels at their centres. The pietra dura was done with thousands of imported precious and semi-precious stones arranged in floral designs that embellish the exterior and interior of the building. The domed white marble mausoleum stands on a plinth with tapering minarets on each corner. Its harmonious proportions and exquisite craftsmanship have made the Taj Mahal one of the wonders of the world. The cenotaphs are located in the central chamber of the mausoleum and are covered in pietra dura work. The title incorrectly states that this is Shah Jahan's cenotaph; it is actually that of Arjumand Banu Begam's.